It feels weird thinking forward to this afternoon's game with Manchester United. It was meant to be pivotal in the race for the title, now it's a match which for us would mean victory would take us within a point of St Totteringham's Day and give us all a moral boost after the eight weeks of woe we've just been through. But that all depends on which Arsenal team turn up. Normally in this situation where the league is out of our reach we play without fear, the handbreak comes off and we'll go out and play football like the Arsenal we know and love. However with this team anything is possible. One thing's for sure. We need to take our chances in front of goal and be ruthless. Otherwise it's certain to come back to haunt us. This season for the manager has been one of the toughest. He's said so much himself and you can see his frustrations on the touchline during every game. "It is certainly the year when I have worked the hardest. Every year has been tough but for the team it has been the toughest. "Over the last five years this has been the highest quality we have produced. We have nothing to be ashamed of [in] our performance. "We have not lost against a low level team. So I give this team a lot of credit. We have battled on all fronts and we have produced quality. We just couldn’t finish the job." I would contest Wenger's suggestion we've seen the best football for five seasons with this team. Yes, the early season games were good. The games against Barcelona and Chelsea at home and Manchester City away especially, but in the games since the Carling Cup final with exception to the Blackpool (away) and Tottenham (away - first half) we've not been at our best. I don't doubt the manager has worked hard this season. But perhaps he's doing too much. When you hear he's been involved with the discussions about the catering contract at the Grove with senior executives at the club, you have to wonder what the manager of our football team is doing at that meeting. You have to ask if he's using his time wisely. Does he really need to be involved? Especially as it's a non footballing matter. And whilst Wenger has ruled himself out of a role away from the training pitch as director of football, I would suggest he already fulfills that role as well as managing our football club. For me something has got to give, especially for the sake of Wenger's health. I know I've been banging this drum a lot in recent weeks, but the club do need to bring someone in who will work alongside Wenger and relieve him of some of the pressure he is under. The role which David Dein filled and has been only partially filled since his departure. Even the players feel Wenger is taking too much on himself. Theo Walcott pointed it out in his interview with The People. "The great thing about our manager is he always deflects things on to himself and keeps things completely away from the team. "But that is where we need to help him out and we haven’t done that in previous weeks. "But I think we are ready now. Maybe instead of waiting for things to happen, we are going to make things happen. We need to do it for him." 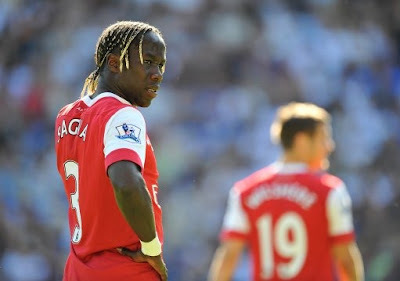 Whilst in the News of the World, Bacary Sagna believes the fault of not winning a trophy this season is with the players. "It's embarrassing to be part of a team that hasn't won a trophy for six years. We failed. It's not the manager's fault, it's the players. "Some people say Arsene Wenger's not doing well, but he doesn't play. Everyone was sad at Bolton. We have to be stronger in battle, that's what we said after the game last Sunday. "We know we are not a bad team. We have the quality to finish first, but we lost. This is the fault of the players - we have failed." And whilst I believe Wenger does take too much on himself, I feel he should be putting some of that pressure on to his players. Some players thrive under pressure. I just wonder if he feels the bunch he has at the club now will crumble. Sanga reveals in the interview that the players have had a number of meetings behind close doors to clear the air following last Sunday's defeat. We've heard about these types of get-togethers in the past and I think it's good for things to be out in the open. If someone stood up and told Eboue what he did at the end of the Liverpool game to gift them a penalty was daft and naive, perhaps he'll never be as stupid again. Peer pressure in some parts is sometimes not a bad thing. The manager has suggested it is too simplistic to suggest all our wrongs would be erased if he brought a number of experienced players into this side. Whilst he is correct, I wonder if he's got this team's balance correct. Think back to the days when Henry, Vieira, Ljungberg et al were at the club. There were a core group of english players who they learned from. Members of the team such as Adams, Seaman, Keown, Parlour, Winterburn. Now who are the younger players in the looking up to? Fabregas, van Persie and Arshavin. It was interesting to find out that Johan Djourou is in fact the longest serving player now at the club, signing for Arsenal three days before Gael Clichy. I just wonder, had Djourou and Clichy been playing alongside Adams et al whether they would now be in a better position to take this team over the line. I would suggest they would. The balance isn't right. The manager knows this and has said he will strengthen key areas this summer. While Emmanuel Petit knows what it's like to play and learn with the Arsenal legends of old, I'm not of the opinion he is right when he suggests in the Sunday Mirror we need three new players. For me it's more about the character of the players we bring in. And I totally disagree with Nigel Winterburn's assessment in the Daily Star Sunday that we should sell Cesc Fabregas this summer and rebuild our team around Jack Wilshere. For me it is to early to change our structure for Jack's benefit and let Cesc leave. Personally I think we need to hold on to our captain for as long as possible so players like Wilshere can develop naturally at their own speed. We would be by far an inferior team without Fabregas. And whilst Wilshere is our future, he is still just 19. This has been his break through season and he's been remarkably consistent. But with all young players you cannot count on them bringing the same level of performance to each game. Next season is going to be very tough for him, as all second seasons are. Elsewhere there are some interesting thoughts from Henry Winter in the Sunday Telegraph. A bit of a transfer rumour round-up? The aforementioned Bacray Sagna is a target for Italian side Roma according to the The People. Whilst the same newspaper suggest we're interested in Charly Musonda, a 14-year-old attacking midfielder from Belgium. (Perhaps a bit too young, even for our first team). The Mail on Sunday link us with a move for Bayern Munich bound Manuel Neuer. An old name to this blog - who we were interested in last summer but were rebuffed in our approach - and has according to the reliable Raphael Honigstein agreed personal terms with Munich. With Szczesny as number one, I think we'll be looking for a back up in the summer for him and Fabianski. That is if we can ofload Manuel Almunia who has another season to run on his deal. That's it for now. I'll post my team preview later.